You might need another person to oversee your financial affairs for a number of reasons. For example, you might be scheduled to have surgery that would require a three-week hospital stay. If you have business scheduled during that period, you can create a power of attorney to authorize another person to conduct that business. This might be limited to collecting payments and depositing them in your bank accounts. Alternatively, you might need the document as part of estate planning so someone can oversee your assets if you lose the ability to do so because of physical or mental deterioration. This case may call for authorization of broad powers over the principal’s finances. You can authorize the agent to manage your real estate, buy and sell your personal property, manage your taxes, collect your benefits, pay your bills, and nearly anything else needed. In this case, you would also want the power to remain in effect after you become incapacitated. 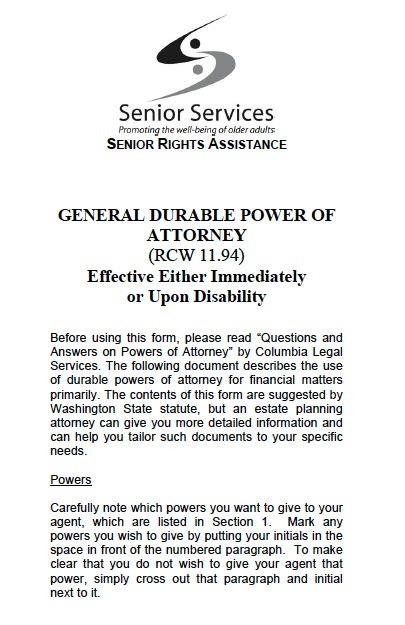 Under Washington state law, you have to indicate that the power of attorney is durable in order to do so. Your agent is also under a number of legal duties. He or she may not use your property for his or her benefit, and the agent must act honestly and in your best interests when acting under the power of attorney.